New Chapter Meeting Location started in February 2019! Tabard Theatre – current and future season dates. The CCB Governmental Affairs Committee is planning District Days instead of a Capitol Day this year. The GA Committee will assist Chapters and Affiliates in prepping for this opportunity with tools and practice sessions. Chapter and affiliate legislative liaisons, and anyone interested , please email Ardis Bazyn at abazyn@bazyncommunications.com asap. · Members will schedule their visits for the week of April 29 through May 3 in your respective state Assembly member's offices. · Practice calls will be scheduled for two dates to select: April 22 or April 24, and Jeff Thom and Sylvia Reese will facilitate these calls. Jeff Thom will write the talking points for the following: AB947, AB1434, Aging and Vision loss resolution, AB169, and AB1286. More Info will follow to all Chapter and Affiliate Presidents and Legislative reps, including information on district office sites, and tools and packets. Join us for this exciting opportunity to meet your local reps and represent CCB to discuss issues that are imperative for all of us. The Silicon Valley Council of the Blind (SVCB) is a 501(c)3 non-profit, tax-exempt organization under the California Council of the Blind. We are a membership organization of persons who are blind or visually impaired, our families and friends. Our goal is to improve the quality of life for all persons with vision loss through advocacy and mutual support. We are organized as a chapter of the California Council of the Blind, which is a state affiliate of the American Council of the Blind, and draw our membership largely from Santa Clara County. · Educate both the public and ourselves about the capabilities and responsibilities as well as the special needs of persons who are blind or visually impaired. · Work jointly with other organizations who share our goals. · Regular monthly meetings are held where persons with vision loss can learn about and discuss issues of concern to them with public officials, professionals in the field of blindness and other blind persons. · Through our annual Barbara Rhodes Adaptive Technology Grant, we offer up to $1500 to a blind or visually-impaired person who can best demonstrate the need for adaptive technology that will improve his/her quality of life of advance her/his educational and/or employment opportunities. To access the current grant application, see www.svcb.cc or email svcb@onebox.com. · A newsletter is published monthly featuring items of current local interest provided in large print, braille, E-mail, and cassette tape. · Our web site has links to resources and contact information. · We continually educate ourselves about legislation and government regulations related to blindness, while actively trying to improve them through testimony and negotiation. For example, we are continuously engaged in efforts to maintain and improve the quality of public transportation, which is so vital to the independence of our members. · SVCB sponsors social and recreational activities where persons who share our goals can get to know one-another and experience the solidarity which helps us all to "keep up the good work". Participation in SVCB is extended to all persons who share our desire to improve the quality of life of persons with vision loss. Suggestions, donations and volunteers to support our work are welcome. Starting with our February 16th, 2019 meeting, from then on SVCB meetings are being held at the Vista Center – San Jose Office, 101 N. Bascom Avenue, San Jose, CA 95128, 1-408-295-4016, every third Saturday from 9:30 AM. to 1 PM. The center is now under the direction of Vista Center for the Blind and Visually Impaired, Palo Alto, CA. We will offer the same lunch function through Subway at the new location as we had in Mountain View. To read timely announcements and find out what will be happening during our next meeting, read our SVCB Phone Tree Message. flyer is available at this link ‘Marie Callender’s’ for you to download and print. Our Next Membership Meeting: April 20, 2019, Vista Center – San Jose Office, 101 N. Bascom Avenue, San Jose, CA 95128, 1-408-295-4016, from 9:00 AM. to 1 PM. 9:00: Coffee and conversation. The lunch order deadline is 9:45. Choose a year, and then select stream or download. All SVCB Officers and Board Members may be contacted by phone at: 888-652-5333 (leave a message). All SVCB Committee members and Chairpersons may be contacted by phone at: 888-652-5333 (leave a message). · Opportunity to serve on the Board or committees and directly influence chapter activities in the blindness community. · May participate in special SVCB activities such as parties and outings. · Become a member of the California Council of the Blind, whose mission is to improve the quality of life for visually impaired people in California. SVCB is a local chapter of CCB, and we actively assist members to participate in CCB conferences and conventions as well as network within the CCB family. · Become a member of the American Council of the Blind, the national organization dedicated to improving the quality of life for visually impaired people in America and the world. Since CCB is a state affiliate of ACB, you'll belong to the ACB family, and we help visually impaired people attend ACB conferences and convention. Becoming an SVCB member is easy - fill out a membership application, and along with membership dues send it to P.O. Box 493, Mountain View, CA 94042-0493. Dues are $10 per year (or $13 if between 7/31 and 12/31 to cover through the next year). Click SVCB Membership Application for a print application to be downloaded that gives all the instructions. For more information, email membership@svcb.cc or call our voicemail box at 888-652-5333 (leave a message). The purpose of the grant is to ensure greater economic opportunity and a richer quality of life for all blind and visually impaired people, which is also the goal of the California Council of the Blind (CCB). 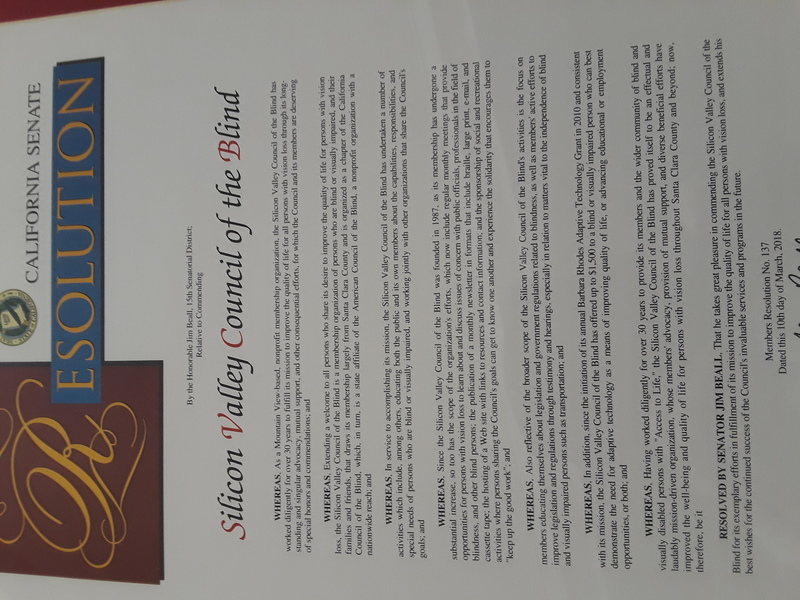 In keeping with this goal, the Silicon Valley Council of the Blind (SVCB), a chapter of CCB, will make a grant of up to $1500 to a blind or visually impaired person who can best demonstrate the need for adaptive technology that will improve his/her quality of life or advance his/her educational and/or employment opportunities. Barbara Rhodes was a respected and valued member of SVCB from 1991 (when she joined the organization) until her death in 2007. She was diagnosed with retinitis pigmentosa midway through her adult life. Friends and colleagues remember her good-natured (if sometimes feisty and outspoken) tendencies whenever issues of accessibility for blind and visually impaired people arose. She was a born advocate. A native New Yorker, she, along with her husband Bill and their son Kenneth, moved to San Jose, California, in 1976 where they bought a home in Almaden. With CCB, Barbara worked tirelessly on the Committee for Access and Transportation (CAT), the Governmental Affairs Committee, the Public Relations Committee, and the Seniors with Vision Loss Committee. In San Jose, she served on the Elderly and Disabled Advisory Committee and the San Jose Disability Advisory Commission. This latter group was responsible for getting over 40 audible pedestrian signals installed throughout the city of San Jose and Santa Clara County. Barbara was passionate about accessible health care, and her voice did much to influence California's Kaiser Hospital system to implement "talking pill bottles," that make taking prescription medications infinitely easier for blind and visually impaired patients. Barbara Rhodes lived a committed life. Her legacy is one of determination and concrete accomplishment. WHAT ARE THE QUALIFICATIONS FOR THE GRANT? WHO WILL SELECT THE WINNERS? The winners will be selected by a task force comprised of SVCB chapter members who will read all applications and select a winner. The award process consists of a completed application, which must be postmarked no later than Thursday, February 28, 2019. The Barbara Rhodes Technology Grant task force will review all applications. If you are selected as a finalist, you will be invited to meet with the committee for an in-person or telephone interview. The committee will notify the winner by early April, and present the application award at our May 18 general membership meeting, where the winner will be invited to attend a special ceremony. 1. Submit a completed application form, see: ‘Application Form’ Please fill in all the blanks. Note: If you would like coaching to get you started on your application, call 888-652-5333 or email svcb@onebox.com. A committee member will contact you. 2. Write a 200-word personal statement, typed and double-spaced. At the end of the application form, you will find instructions explaining what is required in the statement. Note: Some information asked for in the personal statement is the same as in the application form. Consider the statement an opportunity to tell your story more fully, using, if necessary, the facts listed in the application form. 3. Be sure to include a letter from an eye care professional, medical doctor, or blindness professional stating that you are legally blind. IF YOU HAVE QUESTIONS, leave voicemail at 888-652-5333, or email svcb@onebox.com. For more info about the Barbara Rhodes Technology Grant, call 888-652-5333 or email svcb@onebox.com. Click SVCB Barbara Rhodes Grant for a print application to be downloaded that gives all the instructions. Bay Area Association of Disabled Sailors - Departs every Sunday at noon from Pier 40 in San Francisco. Bookshare – Bookshare makes reading easier. Access a huge collection of ebooks for people with reading barriers. With Let’s Play, people who are blind or visually impaired can take lessons, and read music using Braille. Disability Remodeling - What is the Average Cost to Renovate? When you live with a physical disability or illness, keeping fit can be difficult. Let's Talk Low Vision - The monthly conferences from CCLVI can be accessed as podcasts at www.airsla.org/cclvidd.asp. Our goal is to improve the quality of our writing by sharing and discussing our work with each other. If you are a lover of fine writing, we encourage you to join us. Even if you're not an author yourself, you can help by critiquing. We have created a mailing list, Writersretreat on groups.io. There you can post any writing you wish the group to discuss. To subscribe to the group, send email to writersretreat+subscribe@groups.io. The link to the group is groups.io/g/writersretreat/topics. 800-662-6992; ID: 1184109. If you're not on the Board but wish to attend, contact the SVCB President beforehand. VTA/ACCESS - VTA ensures a comparable paratransit service is provided to eligible individuals with disabilities who cannot use conventional public transit service due to their physical, visual or cognitive disabilities. Read to learn more about paratransit Service, eligibility, and how to apply. Tabard Theatre shows: To order tickets, call the Tabard box office at 408-679-2330 and speak to Marilyn Watts, or visit tabardtheatre.org. SVCB members and Blind Center clients should use Discount Code BC27 when ordering. Performances take place at The Tabard Theatre, 29 North San Pedro Street, San Jose, CA 95110. 888-746-1799 (SHN Theaters), or fax your order to 415-581-2121 and ask for AudioVision tickets. If you have any questions, please email didisalvo@msn.com. At our next meeting here in Palo Alto, Son Kim and John Glass will review several products and services which were shown at the CSUN conference in southern California last month. As you probably know, this is the world’s largest technology conference on disability, and there is a lot to talk about! Dawn Wilcox - Sea Trials: Around the World With Duct Tape and Bailing Wire by Wendy Hinman is now available on Bookshare. A shipwreck might end a dream of circumnavigating the globe. Not for the Wilcox family. In 1973, the Wilcox family sets off to sail around the world aboard the 40-foot sailboat, Vela. Do enjoy Dawn Wilcox’s saga as written by her daughter-in-law, Wendy Hinman.